Many of you have sliding glass doors to your deck or patio. And most are broken in one way or another. But you never think to get them fixed, right? And, you’re not alone. You know what I’m talking about. The glass doors are hard to slide. They sometimes fall off their tracks. The latch doesn’t work. There’s a hole in the screen. Or, the screen is missing altogether. The truth is you don’t have to live with your patio door problems. Fix St Louis CAN get replacement parts for your doors. We CAN make your doors slide better and your latches click, often without replacing ANY parts. 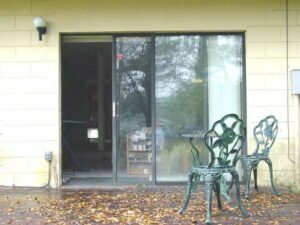 We can also build a new sliding screen door and replace torn screens. So when you’re at your July 4th barbecue, sliding those broken doors back and forth all day long, with a plate full of burgers in one hand and a pitcher of beer or lemonade in the other, vow to restore your freedom as an American to have patio doors that work. Give us a call and you’ll have one more thing to celebrate next July 4th.